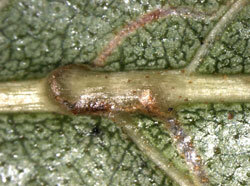 Thick leaf veins form a obstacle for mining larvae. Often a gallery follows a vein for several centimeters, until the vein nears the leaf margin, where the vein becomes much thinner; then the vein is crossed by simply eating through it. When actually a thick vein is crossed, it is done by sneaking over the vein, between the upper epidermis and the body of the vein. A special trait of Lyonetia clerkella is that for this species veins do not form a serous obstacle. 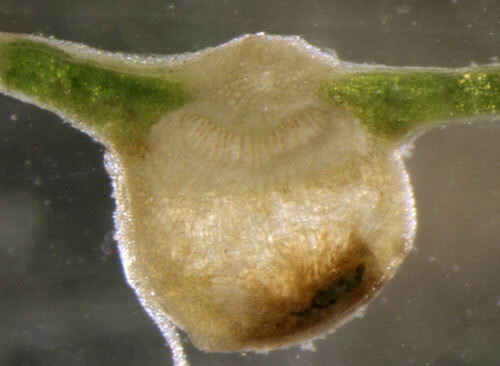 This larva used a different technique: it makes a tunnel on the outside (underside) of the vein.